TEHRAN (Reuters) – Iran says its Revolutionary Guards had been armed with a new medium-range missile, which analysts say could hit Israel or U.S. bases in the Middle East, after successful tests of the weapon. 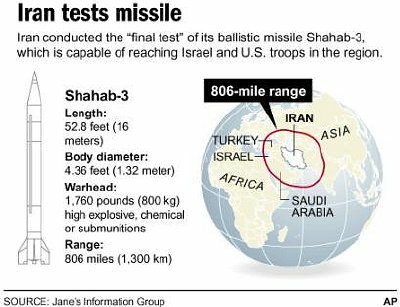 The deployment of the Shahab-3 missile, announced by state television, comes as Iran faces mounting scrutiny about a nuclear energy programme which Washington says may be a front for a covert bid to make atomic arms. State television showed Supreme Leader Ayatollah Ali Khamenei, who heads Iran`s Islamic power structure, attending a military parade where at least one Shahab-3 was on display. Iran announced earlier this month it had successfully completed tests on the Shahab-3, which analysts say is based on the North Korean Nodong-1 missile but has been improved with Russian technology. Its range is about 1,300 km (800 miles). Russian-built Sukhoi Su-25 Frogfoot close support aircraft, attack and transport helicopters were also handed over on Sunday to the Revolutionary Guards, which is separate from Iran`s regular army and reports directly to Khamenei. Television did not say how many new missiles, aircraft and helicopters were now at the Revolutionary Guards` disposal. The armed forces “are ready to confront the enemy with a strong will wherever it is necessary,” television quoted Khamenei as saying at the ceremony. The news came as government officials continued to deny reports that United Nations inspectors had found enriched uranium in environmental samples taken in Iran. “We strongly deny the existence of any kind of enriched uranium in Iran,” government spokesman Abdollah Ramazanzadeh told a news conference.